Technology firms will get "exclusive access" to details of the CIA's cyber-warfare programme, Wikileaks has said. The anti-secrecy website has published thousands of the US spy agency's secret documents, including what it says are the CIA's hacking tools. Founder Julian Assange said that, after some thought, he had decided to give the tech community further leaks first. "Once the material is effectively disarmed, we will publish additional details," Mr Assange said. US federal agencies have launched a criminal investigation into the release of the documents. 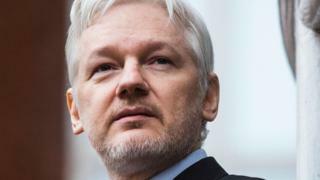 In response to the revelations, CIA spokeswoman Heather Fritz Horniak told the BBC: "As we've said previously, Julian Assange is not exactly a bastion of truth and integrity. "Despite the efforts of Assange and his ilk, CIA continues to aggressively collect foreign intelligence overseas to protect America from terrorists, hostile nation states and other adversaries." Microsoft told the BBC: "We've seen Julian Assange's statement and have not yet been contacted. "Our preferred method for anyone with knowledge of security issues, including the CIA or Wikileaks, is to submit details to us at secure@microsoft.com so we can review information and take any necessary steps to protect customers." In the first tranche of leaks, Wikileaks alleged that the CIA had developed what Mr Assange called "a giant arsenal" of malware to attack "all the systems that average people use". Tech firms, including Google and Apple, have said that they are developing counter-measures to combat any malware that the CIA may have developed. Mr Assange said that his organisation had "a lot more information on the cyber-weapons programme". He added that while Wikileaks maintained a neutral position on most of its leaks, in this case it did take a strong stance. "We want to secure communications technology because, without it, journalists aren't able to hold the state to account," he said. Mr Assange also claimed that the intelligence service had known for weeks that Wikileaks had access to the material and done nothing about it. He also spoke more about the Umbrage programme, revealed in the first leaked documents. He said that a whole section of the CIA is working on Umbrage, a system that attempts to trick people into thinking that they had been hacked by other groups or countries by collecting malware from other nation states, such as Russia. "The technology is designed to be unaccountable," he said. He claimed that an anti-virus expert, who was not named, had come forward to say that he believed sophisticated malware that he had previously attributed to Iran, Russia and China, now looked like something that the CIA had developed. "The type of attack system corresponds to a description we published of that attack system unless of course China has already got hold of these parts of the CIA arsenal and is using it to pretend to be the CIA," said Mr Assange. He said that the intelligence agency could potentially be causing the tech industry "billions of dollars of damage".